The three days at Information Energy 2015 in Utrecht have passed too quickly. Everyone seemed to feel at home, the sessions were interactive and fun, speakers and attendants eager to share information and show how they create and publish content in most diverse forms and channels… that’s what makes an infomedian. To round up the experience, apart from teaching a master class and giving a presentation, I had the honor of giving a short interview and being part of the jury in one of the workshops. The venue also gave it special “energy” – first, Master Classes and presentations at Uni Utrecht, a historical site with classical and retro chambers where the eyes of scientists, professors and artists watched us from old paintings or billboards, followed by workshops at Seats2Meet, a very interesting concept with themed lounges in vintage look. After the full-day Master Class on the pre-conference day, I also gave a short presentation the next day about DITA Linking Best Practice. We have seen examples and done exercises in the workshop. We have also talked about structured, topic-oriented writing and about DITA architecture: map structure, reuse strategy, authoring environment and publishing pipelines. The presentation afterwards was just the shorthand version of the workshop, but it served to start further discussions. Thank you all for attending! It was great meeting everyone in Utrecht. So how are you managing your content linking? As users of technical information (in a manual, in embedded help or on the web), we use links all the time. Sometimes they lead to the exact topic we need and sometimes we end up running around in a wild goose chase. So how do you make sure that your users find their information quickly and easily? By setting up the right linking strategy for your product and your business domain. This sounds easier than it might be, as there are various linking strategies and not one of them is the best in all possible situations. This master class teaches you about the available link management strategies in DITA and gives you a sound basis to decide which strategy works best for your information products. Element-level linking: linking to graphics, tables, steps, files. Hierarchy linking: links generated by nesting, family collections, sequences. Relationship tables: bidirectional links, uni-directional links, collections. Subject-scheme maps: taxonomy and topic assignment. Each section starts with a conceptual overview and a set of practical tips and tricks, followed by hands-on work using your own set of DITA topics and maps on your own computer. Each practical session ends with a group session in which you exchange experiences and learn from each other. After attending this workshop, you will be able to choose a linking strategy that fits your information products like a glove. One of the power features of the DITA environment is the linking mechanism. Combined with keys and conditioning, it gives single-source projects unexpected dimensions. The following examples are created in oXygen Editor v16, and generated using the PDF and the WebHelp scenarios. By integrating your customized plugins for the DITA Open Toolkit, you can further adjust the look and feel of the publications. Based on the topics nesting in the ditamap, and eventually the collection-type attribute, your publishing scenario can generate links between parent and children topics, links between sibling topics, and links to next, previous and prerequisite topics in a sequence. The result also depends on how you set the parameter for related links in the publishing scenario or build script. To display the collection links, set the args.rellinks parameter to "all". If set to "nofamily", only the link to the parent topic is displayed, apart from the links generated from the relationship table. You should also consider, whether you want your plugin to show or hide the short descriptions, and to group the links under a generic Related links label (makes sense to me), or to display the links by topic type: Related concepts, Related tasks, Related information, etc. Let’s see a few examples of publishing from a ditamap with topics A, B, C, nested under an overview topic. Remember: You add all these links without modifying the topics source! Output: In the PDF, the overview topic (parent) has links to the nested topics (children), and the children link to the parent. Output: The parent has links to the children; the children link to the parent and to each other. Output: Let’s look at the WebHelp output, this time. The parent has links to the children in an ordered list; the children have links to the parent, to the previous and to the next sibling. Add the importance attribute to a required task in a sequence (line 6). 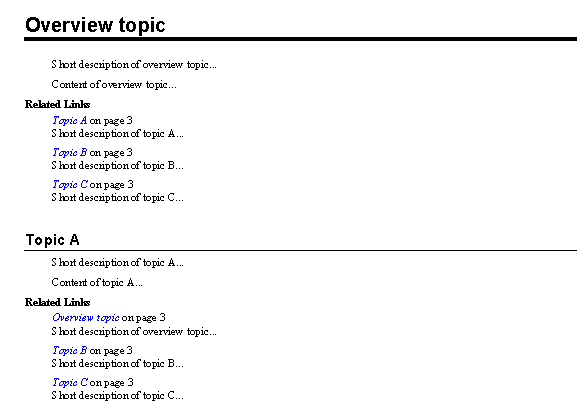 Output: The second and third topics contain a link to the first task, as prerequisite. To manage the linking between topics that are not hierarchically linked, create a relationship table at the end of the main ditamap of your deliverable. Remember, the map hierarchy also creates certain links, so you should avoid duplicates. There are more types of relationship tables (reltable), but I prefer staying with the two-column reltable, which allows me to think of links as unidirectional or bidirectional arrows between the two cells of each row. Apart from linking to DITA topics (concept, task, reference, etc. 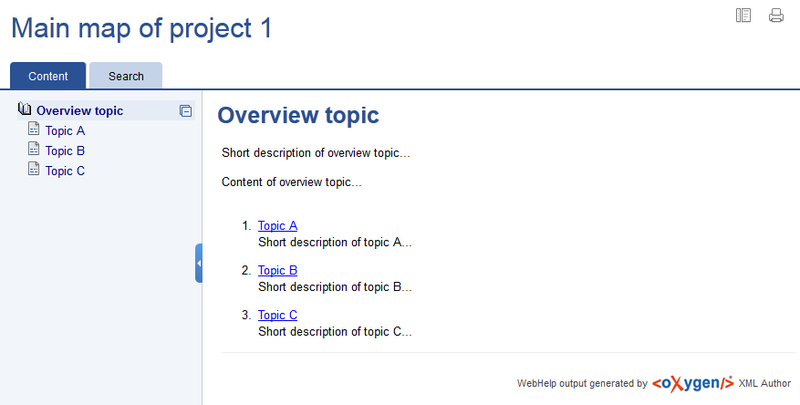 ), you can use the reltable to add links from a topic to external sources, such as web pages or other PDFs. 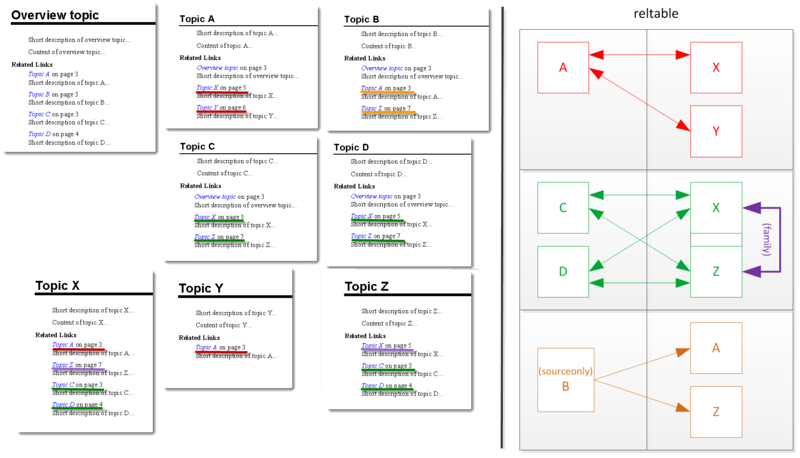 A ditamap with topics A, B, C, D, nested under an overview topic, followed by topics X, Y, Z, and a relationship table. The first row relates topic A to topics X and Y. The second row relates topics C and D with topics X and Z, while X and Z are also grouped in a family (line 30), so they would also link to each other. The last row defines a sourceonly relation (line 36) from topic B to topics A and Z, which means A and Z will not link back to B.
I marked the related links in the published topics in red, green, purple and yellow, so you can identify them in the stylized reltable on the right. To take advantage of these linking mechanisms, the authors in your team have to agree on writing topics for reuse, organizing the cross-references in the reltable and using keys for inline references. I’ll be writing about linking via keys in a future post. 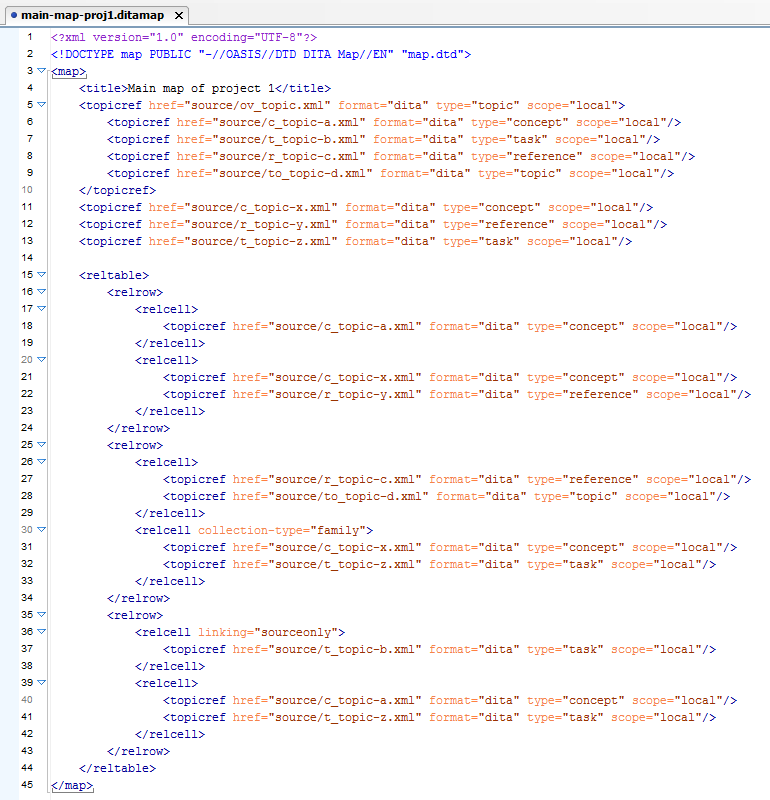 Three days of XML fun!